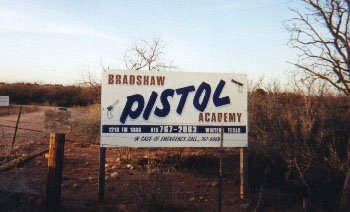 At Bradshaw Pistol Academy we teach the Texas Concealed Carry License course plus all phases of weaponcraft and interpersonal confrontation management. Private training is optional here as well. We also have pistol and rifle ranges open to members. There are no longer walk ins. Family memberships are $130 per year and include all members of the primary's immediate family. Lifetime memberships are available for $500. Fishing privileges are included in the family membership (catch/release only please). The pistol range is equipped with actual street lights which can be turned on and off with switches so that a shooter can practice low light scenarios under proper lighting conditions. We encourage such practical practice. The CQB house is restricted for use by formal classes or private sessions with qualified staff. We host famous instructors from time to time who teach various levels of combat weaponcraft and interpersonal crisis management. Click here for more information on upcoming classes. Eye and ear protection, along with strict adherence to the 4 Rules are mandatory at BPA and are not negotiable. Any willful or flagrant violation of this policy is grounds for expulsion without remuneration. We appreciate your business and want your visit to be a safe and enjoyable one. By the way, there is one additional rule...HAVE FUN!